Hello to all y friends and family. Did you miss me? I've been gone for almost 3 weeks. You don't have answer that. If you're here for the first time, welcome. If you liked my postings on Facebook, you'll equally enjoy the postings I put here. If you're not signed up to my email list, please remember to do so, so you will be notified when I make a posting. 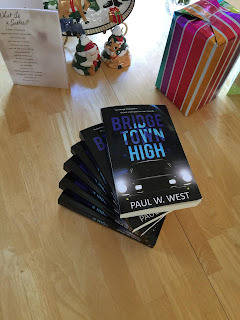 I thought this week that I would take up some serious issues some people have had with my novel, "Bridgetown High." That being, my characters' dialogs and the ending of my book. I guess I can understand why a few people have been put off by the colloquialisms I used in some of the dialog. They either didn't live during the era in which this story is set, or they've forgotten how some people talked back then. Frankly, I've done my best to research the conditions and attitudes of people and tried to mimic the speech patterns of such groups as Italian immigrants, Spanish speaking Mexican immigrants, plus hippie jargon, and the speech patterns of ignorant teenagers who turn out to be dropouts, then the antagonists. TIP FOR YOU: Speaking of characters' dialog, when writing your best selling novel, do your best to make dialog as realistic as possible. Listen to people -- how they talk, phrases they use. However, dialog can't have all the hms and hums or stuttering as most people do, unless the character needs to be a stutterer for some reason. Make sure your dialog is clean and realistic. Another issue some people have had with "Bridgetown High" was the unexpected twist in the end. Actually, it shouldn't come as unexpected. All through the book I've lead up to it, and to a few other twists as well. However, all I can say now is, I'm writing a sequel. Keep posted. All will be revealed in due time. TIP FOR YOU: When writing your best selling novel, make sure all your twists are logical from what has transpired previously in the story. I've read some otherwise good novels that when they got to the last chapter, the twist didn't work, in my opinion. Not only that, but the denouement goes on for several chapters -- wrong too! With all that in mind, most readers of "Bridgetown High" have loved it and did not find fault with it. Even with a couple of negative ratings, it's still rating 4.3 on a scale of 5 at Amazon, 4.36 on Goodreads, and 4.5 on Barnes and Noble. Not bad, but I need more reviews, even negative reviews will be welcomed. I'm not upset about negative reviews. They only help me to write better and avoid mistakes.